The Alba Iulia citadel was built after the establishment of the Habsburg rule in Transylvania and its sculptural program was influenced by the Austrian Baroque patterns. It was the will of the Holy Roman emperor Charles VI under whose rule the citadel developed. Therefore, in his honor the citadel was renamed Karlsburg. But the glorification of the emperor does not end here. One of the monuments that evokes the emperor's image is the 3rd Gate, which, located on the eastern side, represents the main access point to the citadel. Built between 1715 and 1728, the 3rd Gate has the shape of a triumphal arch with three entrances in front of which there is a mobile bridge. The emperor is portrayed by an equestrian statue placed above the gate. He is surrounded by Turkish prisoners and is dressed in a Roman tunic over which he carries a cuirass specific only to the emperor of the Roman Empire and to the superior officers. The imperial helmet worn by the rider completes the feeling that the monarch and through him, the entire House of Austria are descendants of the ancient Roman emperors. The monarch's connection to the 18th century, in which he lived, is highlighted by the representation of the double-headed crowned eagle that carries in its claws the insignia of the Habsburg imperial power - the scepter and the sword. 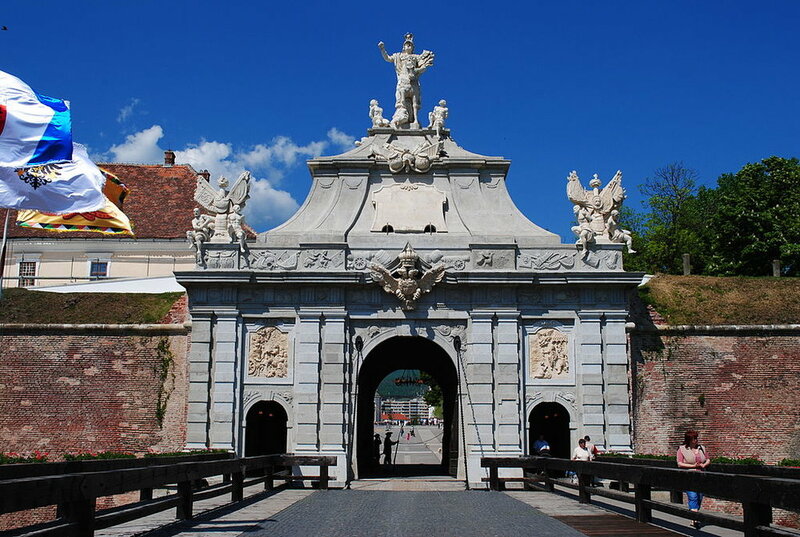 In the upper portion of the gate also can be noticed some muskets, crossed cannons, drums and groups of Turkish prisoners chained to a column adorned with captured trophies, all of which symbolize the triumph of the Habsburg army over the Ottomans. There are two panels located above the pedestrian entrances of the gate. The panel on the right represents the sovereign handing over to Eugene of Savoy the battle flag as a symbol of his investment at the head of the anti-Ottoman coalition. The second panel, located to the left of the main entrance, represents the Marshal of the Austrian Empire, Eugene of Savoy in a chariot drawn by lions symbolizing the victory gained in the military campaign. 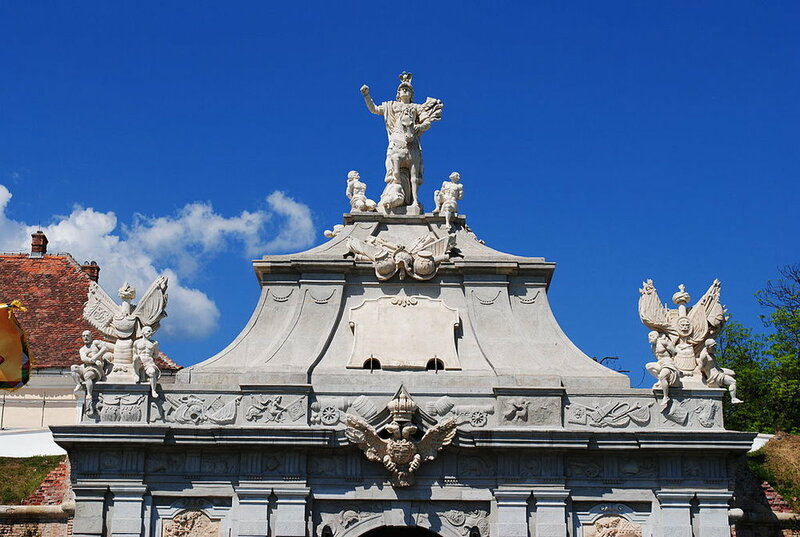 Each pillar of the gate has a statue above, representing a virtue accompanied by the characteristic symbol that distinguishes it: the Abundance with the horn of plenty (cornucopia), the Glory with the model of a temple, the Justice with a balance and the Force with a sword. The 3rd Gate has been restored and was reopened to the public in 2008. If you're visiting Alba Iulia, don't miss this piece of history carved in stone.